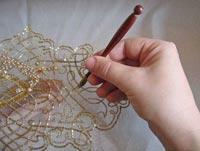 Tambour Beading is a professional hand bead embroidery technique that is performed with a fine hook (a shortened French Cornelli needle) in a holder. This is the technique used to embellish couture garments for the fashion industry in Paris. The Tambour hook is used to embroider chain stitch & attach beads onto fabric that is stretched as tight as a drum over a square embroidery frame. Beads are strung onto a working spool of thread and the beading is worked from the wrong side of the fabric. Bead’s are moved up the thread with one hand and then stitched on in a crochet motion making a chain stitch after each bead. You will learn the basics: how to prepare your fabric on the frame, hook turning directions and you will also be introduced to the chain stitch using polyester & metallic thread. 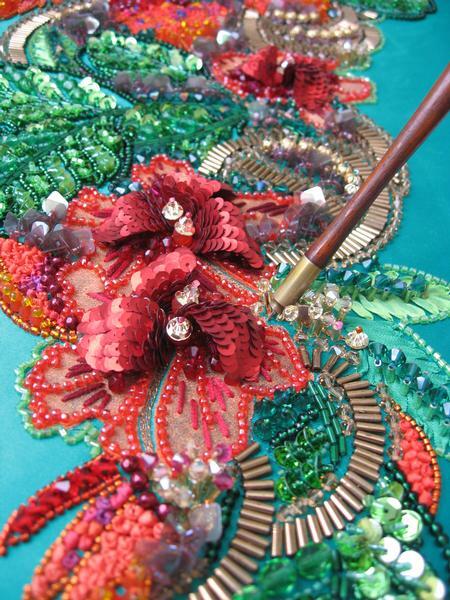 You will also learn to attach Bugle beads onto fabric. This class is a techniques based classes. This project is a sampler only. 2 x quick grip clamps to hold frame to the table. An assortment of colours of polyester threads.